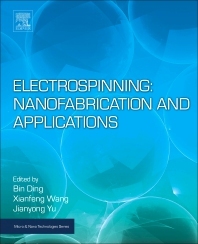 Electrospinning: Nanofabrication and Applications presents an overview of the electrospinning technique, nanofabrication strategies and potential applications. The book begins with an introduction to the fundamentals of electrospinning, discussing fundamental principles of the electrospinning process, controlling parameters, materials and structures. Nanofabrication strategies, including coaxial electrospinning, multi-needle electrospinning, needleless electrospinning, electro-netting, near-field electrospinning, and three-dimensional macrostructure assembling are also covered. Final sections explore the applications of electrospun nanofibers in different fields and future prospects. This is a valuable reference for engineers and materials scientist working with fibrous materials and textiles, as well as researchers in the areas of nanotechnology, electrospinning, nanofibers and textiles. Xianfeng Wang, is Professor at the College of Textiles, Donghua University, Shanghai, China, whose research focuses in the areas of materials engineering and nanotechnology. Jianyong Yu is based at the Chinese Engineering Academy, China. He is professor of Textile Science & Engineering, whose research focuses on the basic theory, key technology and application of textile materials.